On October 29, the seventh and eighth grade music ensembles performed for students during the middle school meeting. 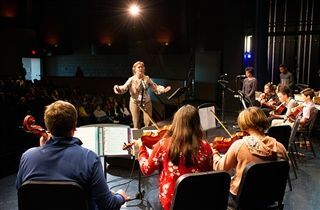 Music teacher Sarah Stone directed students through performances of P!nk’s “What About Us?” (seventh grade) and Far East Movement’s “Rocketeer” (eighth grade). In addition to instruments such as ukulele, guitar, keyboards, percussion, and harp, the performance introduced Launchpads, electronic instruments that can play loops and samples. Ms. Stone stated that the music program is very grateful to the Fine Arts Guild for its support through instrument purchases that have allowed our students such a wide variety of musical experiences.